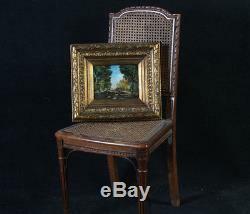 Barbizon landscape of the 19 th century, on wood. 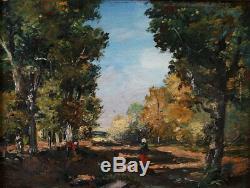 Oil painting on wood, in very good condition. Signed lower left, but illegible. 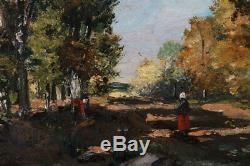 Subject: Undergrowth landscape, typically barbizon. Formats: with frame 40 x 35 cm - without frame 21 x 16 cm. 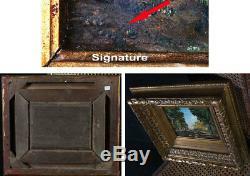 Frame: 19th, gilded wood with gold leaf, depocates the painting. Sold with invoice / certificate. Table visible on avignon (france), free shipping for France. 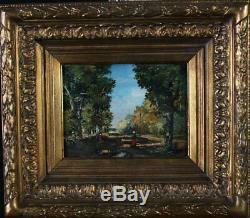 The item "barbizon landscape of the 19th century, on wood" is on sale since Tuesday, October 23, 2018. It is in the category "art, antiques \ art of the nineteenth and before \ paintings, enamels". The seller is "galerie-artableaux" and is located in avignon. This item can be delivered anywhere in the world.